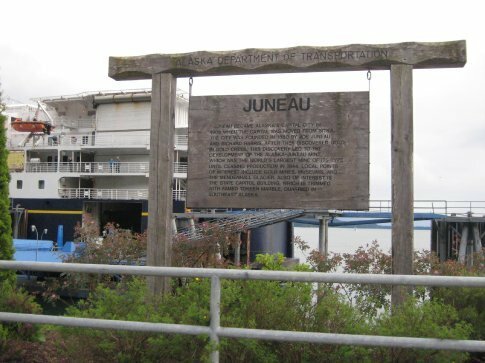 I arrived in Juneau by ferry on a hazy, cloudy day, and it stayed that way for the few days I was there. Rained every afternoon as well, just to cap it off. But other than that, it was a good place to visit, especially since it's home to Mendenhall Glacier, the most accessible glacier in Alaska. Meaning to say you can visit it any time of the year and you won't need a boat or plane to get there, and there are several hiking trails that will bring you close. I chose to take a public bus and then walk 30 to 45 minutes to Mendenhall Valley. There's one point where you turn a corner and suddenly there it is, a patch of icy blue in the distance between the mountains and beyond the trees. You can feel, and almost smell, that you're getting closer as the air becomes crisp and fresh and the temperature drops. And when you get there, oh wow. It's not the largest glacier, but it sits in the valley with a turqoise lake of floating mini icebergs in front of it and a waterfall nearby. Perhaps I'm biased, this being my first glacier and all, but it was absolutely beautiful. The water is a gorgeous blue green colour due to ground up rock sediments as the glacier moves and shapes the valley ecosystem. And it's, of course, ice cold. I also got to touch a large piece of glacial ice that had fallen off! Yes yes, not as amazing as walking on the glacier, but still, I touched it! Downtown Juneau caters to the cruise ships. Several of them arrive every week and flood the streets with tourists. It's quite festive really, and entertaining to walk the streets lined with little shops selling souvenirs, jewellary and native craftwork. Many of them proudly display signs that declare "Owned and run by an Alaskan Family".